I’ve recently passed the “Architecting Microsoft Azure Solutions (70-534)” certification exam. Many of my cloud geek friends asked me to share about details like study material, time for preparation, etc. for this exam. I personally also wanted to share this experience as I really was struggling to gather this information prior to taking this exam. Here is a to-do list that might help you! For senior technical people with Azure exposure, aspiring Cloud architects, those interested in passing the Azure 70-534 test, and all other IT professionals associated with the Cloud computing, especially the ones who want to learn more about designing for the cloud with Microsoft Azure, this tutorial will explain do’s & don’ts while preparing for this certification exam. 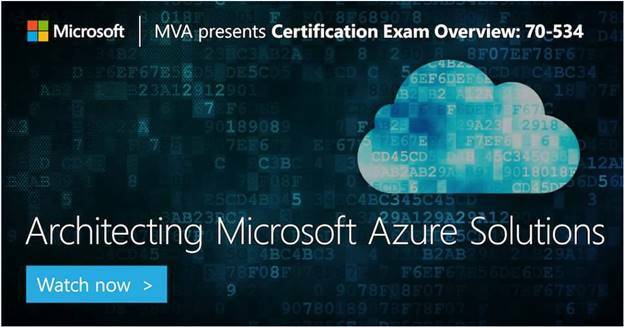 Microsoft Azure 70-534 Certification is one of the most in-demand certifications on the hottest cloud platform, Azure. It has been updated on November 2016, and passing this test gives you the “Microsoft Specialist: Architecting Microsoft Azure Solutions” title. Also, it takes you to a different type of learning experience altogether. Click here to explore more about this exam. Zeal to learn Azure, Microsoft’s constantly growing cloud platform. I will try to keep this article short, and will summarize as mentioned earlier with its Do’s & Don’ts only. Will start with listing don’ts, as following it will lead you closer to success. Don’t ever go for dumps. Most of the available dumps do not help much in preparing you for the exam; rather you will end up with wasting your revision time on this material. Don’t take this exam for granted. After its recent updates from November 2016, it’s now one of the most complex exams to pass. Do try to cover watching ‘Introduction’ or ‘Getting started’ videos available online especially from Microsoft Azure. Prior to appearing for your certification exam, try to complete online courses available on Microsoft Partner network. Give first preference to the course covering Azure Fundamentals, Microsoft Azure Virtual Machines, and Microsoft Azure Storage. If you are good in reading, go for free eBooks from Microsoft Press for Microsoft Azure at Microsoft Virtual Academy. Start with Microsoft Azure Essentials: Fundamentals of Azure, Second Edition by Michael S. Collier and Robin E. Shahan. This will cost you a few bucks, but the book Exam Ref 70-534 Architecting Microsoft Azure Solutions is an excellent resource for exam preparation. Microsoft provides a Free Trial with $200 to spend on all Azure Services. This is the easiest way for getting your hands dirty and setting up some real Azure solutions. Must go through documentation on Azure Automation, Azure runbooks, Azure PowerShell. Last but not least, do watch recently published Microsoft exam 70-534 concepts, especially on recent updates – and exam tips and tricks. I would say, don’t strictly rely on dumps or practice tests, but there is no harm in considering it as part of learning resource. I hope this list of resources along with do & don’ts will help you pass the exam and earn your Azure certification! Also, once you’re done with your Certification or if you have any questions with respect to the same, please do comment below. Knowledge grows by sharing! Don’t forget to share this article. If it has helped you, it will also help many others too! All the very best! Thank You! Happy Azure Coding!